Application: When there is error or damage to ROM or ROM module data, we can read firmware of fault HDD by loading LDR. 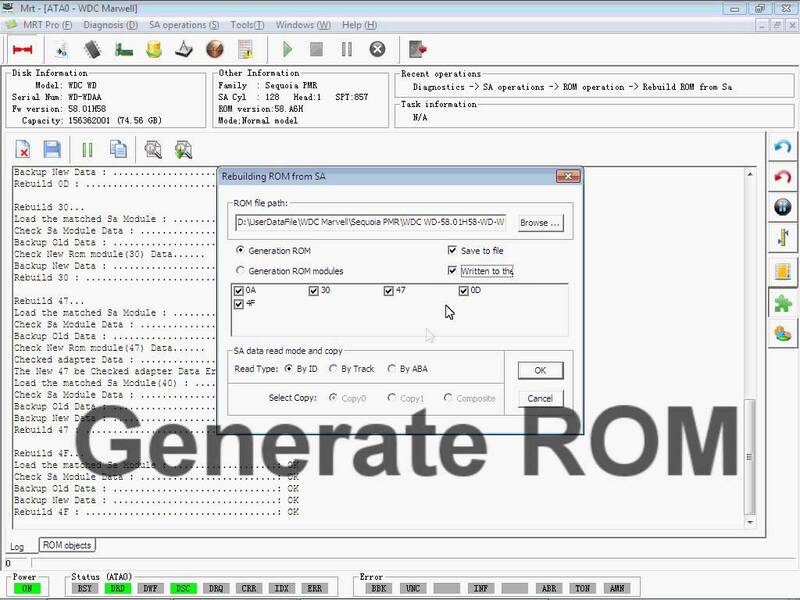 We can use this function to get data from firmware and adapt new ROM and ROM module. 1. Set the file save path in advance. Generally, the default path is OK.
2. Select whether ROM or ROM module is to be adapted with the radio button in path editing box. 3. Choose the read mode of SA firmware data. You can choose Copy0 or Copy1 by selecting By Track or By ABA. 4. Press “OK” button. The program will generate new ROM and ROM module automatically. 5. If the generation succeeds, Click “Write to HDD”. 6. About the log: There are several log messages when generating each module. As long as the last log message indicates success, the module is generated successfully.